Flowers and cards sit at a makeshift memorial down the street from the site of the mass shooting that killed 11 people and wounded 6 at the Tree Of Life Synagogue on Oct. 28, 2018 in Pittsburgh, Pennsylvania. Suspected gunman Richard Bowers, 46, has been charged with 29 federal counts in the mass shooting that police say was fueled by antisemitism. Progressive Jewish leaders have a simple message for President Trump in the wake of the tragic shooting that left 11 people dead at the Tree of Life synagogue: Don’t bother coming to Pittsburgh until you fully denounce white nationalism. Oh, and stop being an absolute racist, xenophobe who hates refugees. 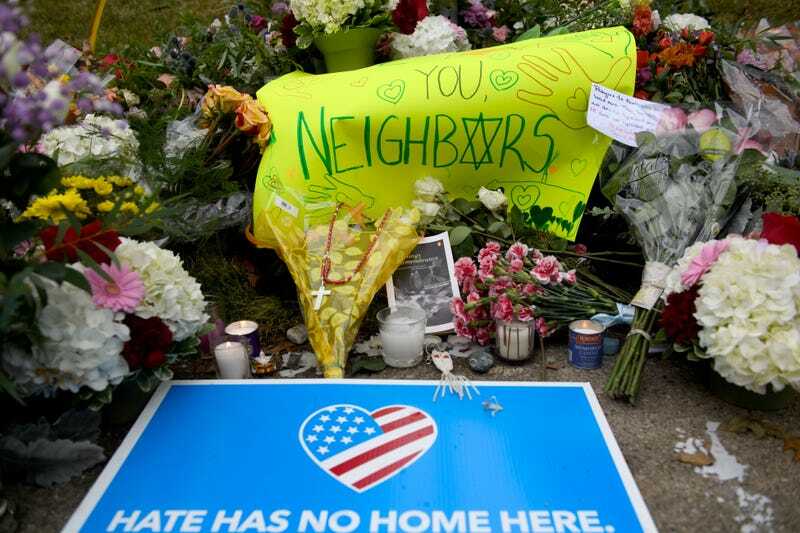 According to The Washington Post, “11 members of the Pittsburgh affiliate of Bend the Arc, a national organization for progressive Jews focused on social justice,” penned an open letter to Donald Trump Sunday, calling the shooting the deadliest attack on Jews in U.S. history. The White House did not respond to the Post’s request for comment because they don’t care. Here’s how Vox recapped the shooting that also left several people injured. On Saturday, a gunman opened fire at the Tree of Life synagogue, killing 11 people and injuring six others, including four police officers. He has been charged with 29 federal crimes, including hate crimes, in addition to 36 local charges. Trump tweeted that the shooting was “evil” and an “assault on humanity” and called for ending anti-Semitism and uniting to conquer hate. He also said he would travel to Pittsburgh. But local Jewish leaders aren’t buying it. Thus far, more than 20,000 people have signed on to the letter.